The new Lockey 2900 Series is perfect for creating security for small businesses and business storefronts. With the Lockey 2900 Series, there is no need to make keys for new employees or change the locks in the event of employee turnover, simply change the code. Most business storefronts and many commercial buildings utilize narrow-stile doors. Narrow-stile doors require certain lock/latch specifications and it is difficult to find keyless applications. Additionally, traditional keyed locks result in unnecessary costs arising from hiring and employee turnover. Keyless locks eliminate those costs, allowing business owners to easily change the user code whenever necessary. The new Lockey 2900 Series offers a variety of keyless options specifically designed for narrow-stile doors. The 2900 Series is intended for both new installations and retrofitting existing doors with keyless security. 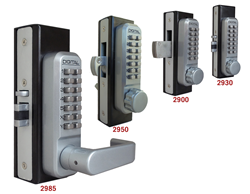 The 2900 Series includes keyless entry locks with a throwbolt (2900), hookbolt (2950) and Adams-Rite style latches (2930, 2945 and 2985). All 2900 Series locks are equipped with a 1 1/8" backset. Utilizing the lock body of the Lockey 2000 Series, the 2900 Series employs narrow-stile latches and bolts to create keyless locks that are perfect for aluminum storefront doors. The throwbolt and hookbolt featured on the 2900 and 2950 are heavy-duty made of 5-ply laminated steel with a concealed hardened steel pin for maximum security. The 2930, 2945 and 2985 are similar to their 2000 Series counterparts (2230, 2435 and 2835), but with an Adams-Rite style latch. The 2930 is an auto-locking Janitor function keyless lock. The 2945 features an inside-lever handle and a hold-open feature. The 2985 offers a lever handle on both the exterior and interior of the door and also features a passage function. The 2900 Series can also be used on gates and is effective for increasing perimeter security. The 2930, 2945 and 2985 are compatible with the GB900 Gate Box or GB2985-LINK (for chainlink gates), while the 2900 and 2950 are compatible with the GB950 Gate Box or GB2900-LINK. The 2950 Hookbolt is perfect for adding keyless security to sliding cantilever gates, while the 2930 and 2985 are ideal keyless applications for pool gates where keyless security is needed with or without passage capabilities. The Lockey 2900 Series has an MSRP starting from $207.90. The keyless locks are available for purchase Online or from any official Lockey Distributor. LockeyUSA Product CatalogBrowse LockeyUSA's full 2013-2014 product catalog featuring a wide variety of door and gate security products.